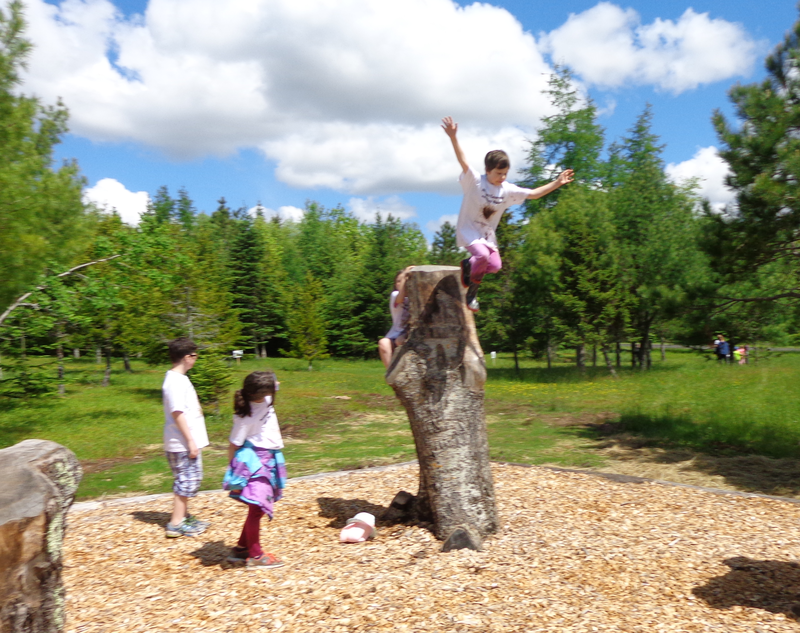 Kids and parents in Nova Scotia, Canada are giving two thumbs up to a couple of the province’s new public play spaces. Middle Musquoidoboit’s Nature Play Space and The Dingle Natural Playground in Halifax make the natural world more accessible to kids. The scale and scope of these two projects are a significant development for what is still a relatively new design aesthetic in these parts. The variety of installations and the age ranges they cater to set Middle Musquoidoboit and The Dingle apart from other natural playscapes in the province. Jubilee Park in Bridgetown, continues to delight the pre-school crowd and the Evergreen organization is working with a few individual schools to incorporate natural play areas as part of the recreation mix. 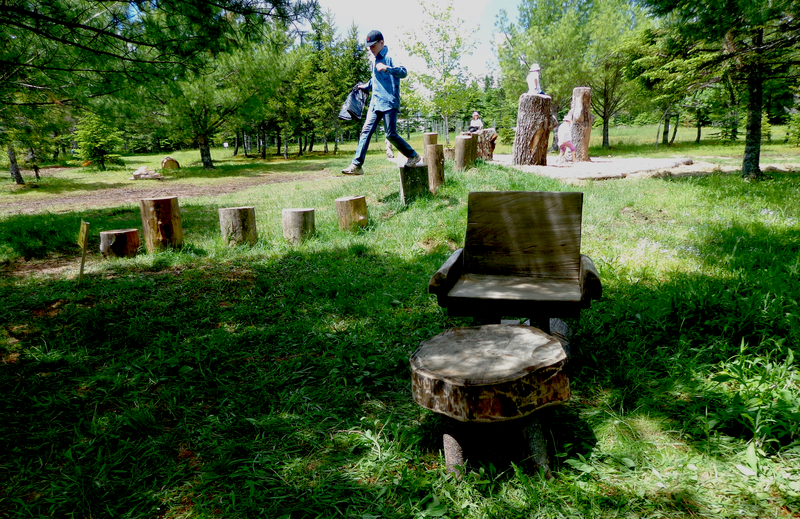 Middle Musquoidoboit’s Nature Play Space will be our first stop. Playgroundology’s next blog post will share some of the fun and excitement of The Dingle playscape’s opening weekend. In Middle Musquoidoboit behind a thin stand of trees there’s a clearing that on opening day buzzes with feverish excitement. Kids are zigging and zagging like hummingbirds from one installation to the next – ponds, slides, a fire tower, sandpits, a nest, a bear den, a tunnel through a small hillock and a personal favourite, a vintage three-seater Flinstone-mobile (see photo gallery here). Tucked away in one corner is a 15 foot long pit partially filled with water that’s already churned brown. The sloping sides get muddier the closer one gets to the waterline. This is the place that holds the greatest promise of transforming white t-shirts each kid was given on arrival into authentic 100% organic dirt fabric. The mud kitchen is an eleventh hour addition to this rootsy wonderland. Middle Musquoidoboit grandmas are the driving force behind this get grimy zone. They gathered up all the equipment – pots, pans, containers, spoons, shovels, pails, cupboards and yes, the kitchen sink – to set up a deliciously fun way to create imaginary delicacies with the most versatile of ingredients, dirt, water and mud. This open air, community kitchen, where there are never too many cooks, adds a certain je ne sais quoi to the overall ambience. Can you say Am-Phi-Bi-An? Frog and salamander prospecting is the main attraction at a kid-sized pond bursting with green along its banks. On a second trip to the Nature Play Space the Girl Power Posse, my two girls and a couple of their friends, fan out and put the multi acre playscape through its paces. On that occasion the pond is the place to be. Getting up close and personal with frogs proves to be a heady elixir that pulls the girls back time and again to try their luck with the dipping nets. At another popular installation, scaling tree trunk towers presents an opportunity for airborne derring-do. The ascent is tough, it’s difficult finding the right footholds and hand grips on the vertical climb. Standing at the precipice, I can only imagine the quickened pace of pounding hearts. Then the launch and a surge of adrenalin in that split second before impact. The playscape offers numerous opportunities for kids to test and push their limits, to assess risk and challenge their physical abilities. These activities help build confidence, develop judgment and, when all goes well, can contribute to creating a reservoir of courage, resourcefulness and resilience. This is a running, leaping, flying kind of place with wows at every turn. There are hills and rocks to climb, dirt and sand galore, small animals in their native habitat to catch and release, trees, grassy expanses and a welcome absence of motorized vehicles. This is a place to move and a place to play in the heart of Nova Scotia, Canada’s Ocean Playground. The Nature Play Space is a project led by the Department Of Natural Resources’ Natural Resources Education Centre. Two of the Centre’s team members, Amelia Kennedy and Sara Hill, were inspired to create a natural play space after attending an environmental educators conference with participants and presenters from throughout North America. They left the conference with an aspirational goal that took form with considerable community engagement and sweat equity from volunteers in addition to support from their provincial government department. Two community build days, donations of labour and materials and invaluable advice were key ingredients in the success of the project. Nature aficionado, designer, trail developer and heavy equipment operator Garnet McLaughlin of Cobequid Consulting gets a huge shout out for his contributions. So what good things are happening? Our two visits to date resonated with excitement, laughter and an appreciation of the natural world. We’ll be regulars enjoying the leisurely drive there and back through Nova Scotia’s heartland. For those readers who are curious about the pronunciation of Musquoidoboit click play below and listen to the GirlPower Nature Play Chorale who at the end of their song nail it. 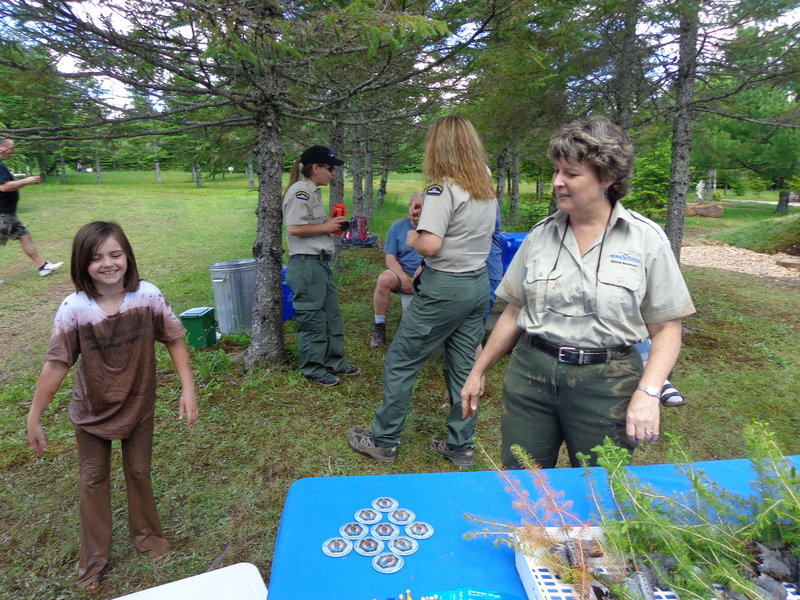 This entry was posted in #girlpower, #girlsrule, #playrocks, #riskyplay, Cobequid Consulting, Middle Musquoidoboit, Mud Kitchen, Natural Play, natural play space, Natural Playscapes, Natural Resources Education Centre, nature play, Nova Scotia, NS Department of Natural Resources and tagged Musquoidoboit Harbour, Natural Playscape, Nature. Bookmark the permalink. Thanks for sharing with your readers Nigel. Having had a look at some of the places you’ve designed, I think you would like this space. Cheers from Nova Scotia.